Background: Child abuse is a major problem globally. Nonaccidental fractures are the second most common injury among physically abused children; however, there is a lack of studies describing the characteristics of nonaccidental fractures in Saudi Arabia. Objectives: The objective of this study was to determine the characteristics of nonaccidental fractures among abused children in Riyadh, Saudi Arabia, using radiography. Materials and Methods: This retrospective study analyzed the data and radiographs of all nonaccidental fracture cases in children (aged ≤14 years) registered in the National Family Safety Program Registry at King Abdulaziz Medical City, Riyadh, between 2009 and 2015. Results: A total of 1512 cases of child abuse were found in the National Family Safety Program Registry database from Riyadh city. From these, 103 fractures were identified; however, radiographs were available for only 70 fractures from 56 children. Of these, 33 (59%) were boys, and 25 (45%) were aged 1–5 years. In terms of the type of abuse, neglect was more common than physical abuse (52% vs. 45%). History of injury was identified in 75% (42) of the cases, of which fall accounted for about 55% (23). Nearly 79% of children presented with a single bone fracture, while 21% had multiple bone fractures. The most common sites of fractures were skull (40%), upper limbs (31%) and lower limbs (29%). The most common fracture pattern was transverse fractures (48%), and it was mainly diagnosed in skull fractures (51%). Conclusions: This study found that in Riyadh, Saudi Arabia, neglect is the most common cause of nonaccidental fractures, abusive head trauma is the most commonly associated injury and transverse fracture is the primary pattern of fracture in abused children. Notably, as most children experienced a single-bone fracture, the authors recommend clinicians to lower their threshold of considering abuse even in cases with an isolated fracture. Child abuse is considered a major problem globally. According to the World Health Organization's Global Status Report 2014, about one-quarter of all adults from 133 countries reported experiencing physical abuse as children. In addition, in the US Department of Health and Human Services Children's Bureau 2016 report on child maltreatment, it was found that 1750 children died because of abuse., As recommended by several child protective registries, child abuse is also termed as child maltreatment, which can be classified into either physical abuse or neglect leading to physical harm to a child. Identifying physical abuse cases is critical, as it is more harmful to the child physically and emotionally, and thus its identification would accelerate child protection care and prevent further harm. Unfortunately, clinicians commonly misdiagnose physical abuse of children because caregivers tend to intentionally modify the history. For example, in Canada, a study found that in children aged <3 years, the percentage of misdiagnosing or misclassifying fractures caused by abuse is as high as 20%. Nonaccidental fractures (NAFs) are considered as the second most common injury among physically abused children. About one-third of the children who experience physical abuse present with skeletal fractures and would eventually be evaluated by orthopedic surgeons, thereby highlighting their role in detecting and evaluating potential cases of child abuse. Importantly, as many children present with only isolated fractures, all health-care professionals, especially orthopedic surgeons, must be aware of the characteristics of fractures resulting from physical abuse. The most frequent musculoskeletal manifestations of child abuse are rib, skull, humeral and femoral fractures. In most patients, radiographic imaging plays a major role in the accurate diagnosis of child abuse. However, the prevelance of physical evidence documented by diagnostic imaging studies is relatively small when considering all cases of child abuse. Nonetheless, a number of factors are suggestive of NAF. Combination of a patient's age and fracture location can reproducibly differentiate abuse from accidental trauma. In a pediatric emergency department in the United States, the proportion of limb fractures due to abuse varied significantly across age groups, from 32% in children aged <18 months to 2% in children aged ≥18 months. Up to the age of 1 year, one of three fractures is nonaccidental, compared with one of nine fractures up to the age of 19 months, and one of 205 fractures between the age of 19 months and 5 years. The National Family Safety Program Registry (NFSP-R), a centralized database for child abuse that collates data from 48 child protection centers (CPCs) located across Saudi Arabia, found that the number of confirmed child abuse cases increased in 2009 compared with that from previous years. However, this may also likely be because previously clinicians in Saudi Arabia did not have an institute that could intensively investigate and confirm child abuse. Further, this registry found that neglect is the most common type of abuse followed by physical abuse. As each country has its own cultural background, laws and reporting system, it is necessary to conduct local and regional epidemiological studies and accordingly raise awareness among physicians for early detection. This, in turn, would help limit and prevent children from further abuse. However, to the best of the authors' knowledge, currently, there are no studies describing NAF among abused children in Saudi Arabia. Therefore, to fill this gap in the literature, the aim of this study was to determine the characteristics of NAF among abused children in Riyadh, Saudi Arabia, using radiographs. In this retrospective study, the authors reviewed all confirmed cases of NAF among children aged ≤14 years in the NFSP-R from a CPC in King Abdulaziz Medical City (KAMC), Riyadh, Saudi Arabia, between 2009 and 2015. The study was approved by the Institutional Review Board at King Abdullah International Medical Sciences Research Center (RC15/114) on November 11, 2015. The CPC in KAMC is considered a referral center for complicated cases. All suspected cases of child abuse at KAMC (at both emergency and outpatient clinics) are reviewed by the Suspected Child Abuse and Neglect (SCAN) team, which is a multidisciplinary team of physicians, nurses and social workers with extensive experience in the management of child abuse cases. This team also reports to the social service department and law enforcement agencies in Saudi Arabia, as required by the national law. A data collection sheet recorded the following information: demographic data, admission date, type of abuse (physical abuse or neglect), fracture information, mechanism of injury, associated injuries and health problems, complications, perpetrator and status after injury (such as mortality). All radiographs were reviewed by a radiologist and a pediatric orthopedic surgeon to identify the fracture type and site and to exclude incorrect diagnosis. The fracture information included fracture site, bone, number and pattern. Children were divided into the following three age groups: infants (aged <1 year; Group 1), preschool children (aged 1 year to <6 years; Group 2) and schoolchildren (aged ≥6–14 years; Group 3). A descriptive analysis of the characteristics of NAF was performed using SPSS software version 20.0 (SPSS Inc., Chicago, IL, USA). A total of 1512 cases of child abuse were found in the NFSP-R database of Riyadh city. From these, 103 fractures were identified as a consequence of physical abuse or neglect. However, for further analysis, radiographs were available for only 70 fractures in 56 children. Of these, 33 (59%) were boys, and most were preschool children (45%) followed by infants (34%). Of the 56 children, 39 (70%) were admitted to the hospital: 15 (38.5%) to the intensive care unit and 24 (61.5%) to regular wards. Of these 39 children, 17 (43.6%) were discharged by a caregiver different to that at the time of admission, after undertaking proper procedures considering the safety of the child. Unfortunately, three (5.4%) children died due to abuse. In terms of history of chronic diseases, nine (16.1%) children were found to have had a previous history of chronic disease. Of these, three children had motor and sensory disabilities, two had spina bifida and four had seizure disorders and repeated respiratory infections. In terms of the type of abuse, 25 (44.6%) children experienced physical abuse and 29 (51.8%) experienced neglect; in two (3.6%) children, the type of abuse was not known. The types of injuries were known in 42 (75%) children, with fall accounting for more than half (54.8%), followed by a direct hit (26.1%) and, lastly, neglected by parents or playing with a gun (4.8% each). In terms of extracting a clear history of the injury, the authors found that the SCAN team was able to obtain a clear history in most neglected cases (65.7%) but were unable to extract a clear history in most physical abuse cases (61.9%) (P = 0.032). Of the 17 children who did not require hospitalization, 10 (58.8%) did not have a clear history of the injury. Of those who were successfully discharged without admission to the hospital, the complete history of the injury and circumstances were available for only 41.2% of the children. The association was statistically significant [P = 0.030; [Table 1]. With regard to the perpetrators, 41 (73.2%) children had a known perpetrator. Of these, 35 children were abused by their parents and 6 children by housemaid and stepparents; 61% of these children were neglect cases and 39% were physical abuse cases. In terms of neglect cases with known perpetrators (n = 25), 52% was because of both parents and 40% was because of mothers alone. In terms of physical abuse cases with known perpetrators (n = 16), both parents were responsible for 6.25% of cases, mothers alone for 37.5% and fathers alone for 25%. Further, 31.25% (n = 5) were physically abused by either a housemaid or stepparent [Table 2]. In cases where the perpetrator was not known, most (60%) were presumed to be physical abuse cases after investigation by the SCAN team, which was in contrast to cases where the perpetrator was known. Moreover, the relationship between identifying the perpetrator and diagnosing the type of abuse was statistically significant [P = 0.048; [Table 2]. About 79% of the 56 children presented with a single bone fracture. In terms of the site of fracture, skull fractures were the most common (40% of the 70 fractures), followed by lower limb fractures (28.6%), upper limb fractures (24.3%) and ribs (7.1%) [Table 3]. In terms of patterns of fractures, eight patterns were found in the study. Transverse fracture was the most common and was found in 37 (48%) fractures; of these, 19 (51.4%) were detected in skull fractures. The remaining fractures were distributed as follows: displaced, 15 (19.5%); spiral, 8 (10.4%); comminuted, 6 (7.8%); oblique, 6 (7.8%); angulated, 3 (3.9%); greenstick, 1 (1.3%); and open, 1 (1.3%). In addition to fractures, 45 associated injuries were recognized in 23 (41.1%) children. Of these, 61% of the children were diagnosed with abusive head trauma (shaken baby syndrome); 30% with isolated subdural hematoma; 35% and 30% had nonaccidental burns and bruises, respectively; and 11% with Munchausen syndrome by proxy – a form of child abuse in which parents/caregivers fabricate physical signs for false illness. Munchausen syndrome diagnosis was confirmed by a multidisciplinary team comprising of a pediatric physician and a team from the NFSP-R (trained in identifying such cases). The rest of the associated injuries (4%) were lacerations in various body parts. In children who had been physically abused, associated injuries were commonly observed (60.9%), whereas in those who were neglected, isolated injuries were more common (60.6%) (P = 0.171). The cases that were not classified as neglect or physical abuse had isolated NAF. Further, in children with and without associated injuries, single fractures were more commonly observed (82.6% and 51.5%, respectively). This association was statistically significant [P = 0.017; [Table 4]]. In addition, most (57.1%) of the multiple fracture patterns were found in lower limbs, whereas most (61.5%) of the single-fracture patterns were found in the upper limbs. This association was not statistically significant (P = 0.519). With respect to extremity fractures, it was found that children aged ≥ 6 years (Group 3) most commonly (55.6%) had single fractures, whereas in the other age groups, multiple fractures were more common. This association was statistically insignificant [P = 0.870; [Table 5]. Specifically, in terms of the fracture pattern, transverse fractures were most commonly observed in all age groups (Group 1 = 22.2%; Group 2 = 18.2% and Group 3 = 44.4%) [Table 6]. In Group 2, 18.2% of the fractures were spiral displaced fractures, while in Group 3, 22.2% of the fractures were oblique displaced fractures. In Group 1, several fracture patterns were observed: oblique, oblique displaced, spiral, spiral displaced, transverse angulated and transverse displaced (all 11.1%). Child abuse is a critical issue that is considered a major problem worldwide. Health-care providers play a crucial role in identifying child abuse. Identifying NAF, which is the second-most common type of injury in physically abused children, is one such method. However, there were a lack of studies describing the characteristics of NAF in Saudi Arabia. The current study found that in Riyadh, Saudi Arabia, neglect is the common cause of NAF and that most children present with a single bone fracture. Further, this study also found that transverse fracture is the most common pattern of fracture. The current study found NAF to be more frequent in boys than girls (59% vs. 41%) and in children aged <6 years than children aged ≥6 years (79% vs. 21%). These findings are similar to that of Loder et al., who found that boys account for 51% of NAF, but in contrast to that of Gera et al., who found 73.3% of NAF were in girls. In the current study, boys were found to be physically abused more than girls, although the difference was negligible, and the rate was similar to that observed in national registries. In earlier studies, multiple bone fractures were more frequently reported in abused children. Further, in a recent study, Leaman et al. analyzed the data of 16 confirmed cases of abuse in children aged <2 years and found 13 (81%) children had multiple fractures. Nonetheless, a recent study from Singapore found multiple bone fractures to be rare, as it was reported in only 8.4% of the studied children. Similarly, in the current study, most children (79%) had a single bone fracture. Collectively, the recent results signify that clinicians should lower their threshold in considering abuse even in cases with an isolated fracture. In the current study, skull fractures were most commonly observed (40%), followed by lower limb fractures (most commonly in femur: 17.2%) and upper limb fractures (most commonly in humerus: 14.3%). These findings are in agreement with that of a previous study. In contrast, other studies have found forearm (29%) and humerus (28.5%) fractures to be the most common sites in their studies. The most common fracture pattern in the current study was transverse fractures, and skull fractures accounted for 51% of this fracture pattern. Similarly, in terms of fracture patterns, Leaman et al. also found transverse fractures to be more common, with 8 of 11 femur fractures having the transverse fracture pattern. However, it should be noted that patterns do not significantly help guide a physician toward the suspicion of abuse,,,,,,, likely because common fracture patterns are likely to differ. Gera et al. compared data of long bones from 35 patients and found oblique fractures (37.14%) to be the most common among their population; nonetheless, they found the rate of transverse fractures to be relatively high at about 26%. Kemp et al., in their systematic review, found no significant differences in patterns of fracture. However, as transverse fractures are generally associated with high-impact trauma, we believe that in children with transverse fractures, child abuse should be considered. In children with associated injuries, abusive head trauma was most commonly diagnosed (61%). However, a previous study showed that most abused children (43%) had contusions as an injury associated with fractures. The findings of the current study can be attributed to the high proportion of infants in the studied population. Therefore, the authors recommend that orthopedic surgeons and emergency care clinicians should be aware of this association and examine infants with fracture likely due to abuse for abusive head trauma through head computed tomography, retinal examination for hemorrhages and whole-body skeletal radiography. In this study, about two-thirds of the study population were admitted to the hospital, of which about 40% were to the intensive care unit. High rates of associated abusive head trauma, which is a severe injury, could likely have been a reason for such high admission rates. In addition, our institute is a referral center where the SCAN team can accept and manage severe cases of physical abuse, further highlighting the seriousness and acuity of the cases in this study. Furthermore, the SCAN team always considers the safety of the children before admitting or discharging them. It should be noted that most earlier studies have only included abused children who were admitted to hospitals.,, This may be attributed to policies applied by authorities to admit every abused child or a limitation in reporting cases with suspected abuse. In the Arab region, only few similar studies have explored NAF in children. One such study was recently conducted in Egypt by Ghanem et al., who analyzed the data of 109 children with skeletal injuries and found 12 cases of child abuse. Of these 12 cases, 8 were identified as neglect cases, 3 as exploitation of labor and 1 as physical abuse. In addition, the study found that about 55% of neglect cases presented with lower limb fractures mainly due to falling from height. However, given the lack of clinical and statistical significance, these data are not representative of the population. In addition, the study lacks details regarding the pattern of fractures and their associations with multiple factors. There are limited data describing the reason of injury in NAF. Gera et al. reported that most of their patients experienced falls (74%), which is similar to our data (54.8%) and that of Ghanem et al. Unfortunately, most studies on this subject have a small sample size, and thus the representativeness of the findings is limited. This issue can affect the presented results and obscure any significance. In our study, parents accounted for 85.4% of known perpetrators. Of the known perpetrators, neglect by both parents was diagnosed in 52% of the cases, while mothers alone accounted for 40% of the neglect cases. However, in physical abuse cases, mothers and fathers were both almost equally responsible (37.5% and 25%, respectively). These results are consistent with that of Fong et al., who found that parents (including stepparents) were the largest (70%) group of perpetrators. The authors believe that differences in the roles of parents may be the reason of such results. In general, as mothers are likely to tend more to children, they were more commonly found to be blamed for their child's injury in the current study. However, Gera et al. found that nonfamily members commonly caused NAF (47.6% of the known perpetrators). 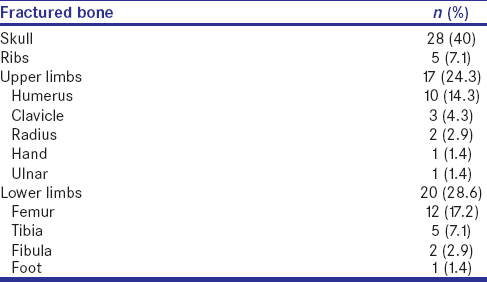 This is a retrospective review of a registry database with cases of abuse that presented to our hospital, and thus a reporting bias and lack of proper documentation are major limitations of this study. One-third of the study patients did not have a history of injury, which could be due to lack of documentation or difficulties in extracting the history from abusive caregivers. Moreover, the study population is from one referral institute and the sample size is small, and thus the findings of this study may not be representative of the entire population at Riyadh, Saudi Arabia. However, child abuse is still underreported in Saudi Arabia, and this may explain the small number of cases. Finally, the authors could not evaluate all reported fractures of abuse cases due to the limited availability of radiographs. This study found that in Riyadh, Saudi Arabia, neglect is the most common cause of NAF in abused children and parents are the major perpetrators. The authors recommend that emphasis should be placed on parenting programs that provide parents with knowledge and support to enhance child care. In terms of fracture characteristics in abused children, transverse fracture was found to be the most common pattern. Further, abusive head trauma was the most common associated injury with NAF. This injury requires intensive management and can have a devastating consequence in the form of motor and sensory disabilities. Clinicians and other health-care providers should be aware of these associations, and hospital-based prevention programs should be incorporated for all expecting parents to explain the dangers of shaking babies and the consequences of head injuries on infants. Finally, as most children in this study presented with a single bone fracture, the authors recommend that clinicians to lower their threshold in considering abuse even in cases with an isolated fracture. World Health Organization. Global Status Report on Violence Prevention; 2014. Availble from: http://www.who.int/violence_injury_prevention/violence/status_report/2014/en/. [Last accessed on 2018 Nov 08]. Administration for Children & Families. Children's Bureau-Child Maltreatment; 2016. Available from: https://www.acf.hhs.gov/cb/resource/child-maltreatment-2016. [Last accessed on 2018 Nov 08]. Flaherty EG, Perez-Rossello JM, Levine MA, Hennrikus WL; American Academy of Pediatrics Committee on Child Abuse and Neglect, Section on Radiology, American Academy of Pediatrics. Evaluating children with fractures for child physical abuse. Pediatrics 2014;133:e477-89. O'Neill JA Jr., Meacham WF, Griffin JP, Sawyers JL. Patterns of injury in the battered child syndrome. J Trauma 1973;13:332-9. Ravichandiran N, Schuh S, Bejuk M, Al-Harthy N, Shouldice M, Au H, et al. Delayed identification of pediatric abuse-related fractures. Pediatrics 2010;125:60-6. Kocher MS, Kasser JR. Orthopaedic aspects of child abuse. J Am Acad Orthop Surg 2000;8:10-20. Kemp AM, Dunstan F, Harrison S, Morris S, Mann M, Rolfe K, et al. Patterns of skeletal fractures in child abuse: Systematic review. BMJ 2008;337:a1518. Bullock DP, Koval KJ, Moen KY, Carney BT, Spratt KF. Hospitalized cases of child abuse in america: Who, what, when, and where. J Pediatr Orthop 2009;29:231-7. Coffey C, Haley K, Hayes J, Groner JI. The risk of child abuse in infants and toddlers with lower extremity injuries. J Pediatr Surg 2005;40:120-3. Pressel DM. Evaluation of physical abuse in children. Am Fam Physician 2000;61:3057-64. The National Family Safety Program. Hospital-Based Child Maltreatment Registry-Annual Report; 2016. Available from: https://www.nfsp.org.sa/ar/projects/NationalRecord/Documents/NFSR%202016_Ar_En.pdf. [Last accessed on 2018 Nov 11]. Loder RT, Feinberg JR. Orthopaedic injuries in children with nonaccidental trauma: Demographics and incidence from the 2000 kids' inpatient database. J Pediatr Orthop 2007;27:421-6. Gera SK, Raveendran R, Mahadev A. Pattern of fractures in non-accidental injuries in the pediatric population in Singapore. Clin Orthop Surg 2014;6:432-8. Council of Health Services. Hospital-Based Child Maltreatment Registry-The Annual Report; 2012. Available from: https://www.nfsp.org.sa/ar/projects/NationalRecord/Documents/english.pdf. [Last accessed on 2018 Nov 08]. Bishop N, Sprigg A, Dalton A. Unexplained fractures in infancy: Looking for fragile bones. Arch Dis Child 2007;92:251-6. Rennie L, Court-Brown CM, Mok JY, Beattie TF. The epidemiology of fractures in children. Injury 2007;38:913-22. Day F, Clegg S, McPhillips M, Mok J. A retrospective case series of skeletal surveys in children with suspected non-accidental injury. J Clin Forensic Med 2006;13:55-9. Belfer RA, Klein BL, Orr L. Use of the skeletal survey in the evaluation of child maltreatment. Am J Emerg Med 2001;19:122-4. Leaman LA, Hennrikus WL, Bresnahan JJ. 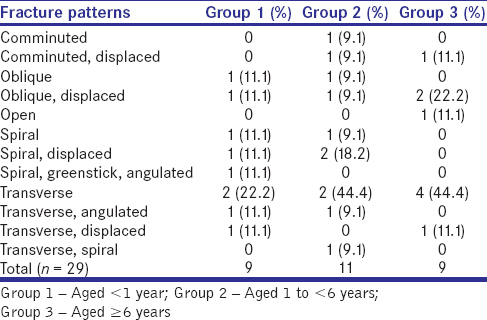 Identifying non-accidental fractures in children aged <2 years. J. Child. Orthop. 2016;10 (4):335-341. doi: 10.1007/s11832-016-0755-3. Fong CM, Cheung HM, Lau PY. Fractures associated with non-accidental injury – an orthopaedic perspective in a local regional hospital. Hong Kong Med J 2005;11:445-51. Leventhal JM, Gaither JR. Incidence of serious injuries due to physical abuse in the United States: 1997 to 2009. Pediatrics 2012;130:e847-52. Almuneef M, Al-Eissa M. Preventing child abuse and neglect in Saudi Arabia: Are we ready? Ann Saudi Med 2011;31:635-40. Ghanem MA, Moustafa TA, Megahed HM, Salama N, Ghitani SA. A descriptive study of accidental skeletal injuries and non-accidental skeletal injuries of child maltreatment. J Forensic Leg Med 2018;54:14-22.